Acne! One word that makes us cringe at the memory it has left behind. For many, acne is still a part of their present. But, is acne only limited to those small, red, bumps on the skin? Or does it have few other shapes and sizes that we often see on the skin, but are not sure if it is acne? Sadly, acne has few other types too. Let’s get to know some of them one by one! Probably the most common type of acne, blackheads form when a hair follicle gets clogged with oil, dirt and dead skin cells, resulting in a bump called comedo. When the skin over this bump opens, air exposure causes it to look black, thus the name. They are different from the regular acne as blackheads are not red or inflamed. Although blackheads are pretty common on the face, around the nose tip and cheeks, they are also found in the back, chest, neck, arms, shoulders, etc. Too much oil production, buildup of dead skin cells, hormonal changes, birth control pills, certain medication, etc., are the prime causes of blackheads. The best ways to prevent blackheads is to wash the skin regularly, using oil-free products, exfoliating the skin once in a while, etc. There are many medical and non-medical treatments available in the market that can help get rid of blackheads. Till the time the skin on the comedo does not open it, it is known as a whitehead. A step behind the blackhead, excess oil, dead skin cells and bacteria are the leading causes of whiteheads too. Chances are that if you can keep your skin clear of clogged pores you can steer clear of whiteheads, and eventually blackheads. Hormonal changes during puberty, menstruation, pregnancy, menopause, etc., can trigger excess oil production, thus clogging the pores. 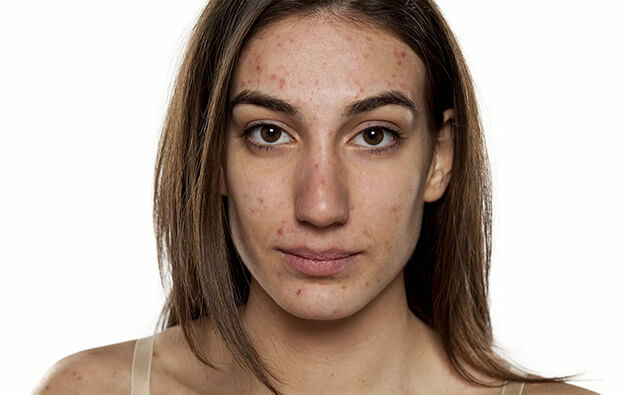 Genes too have a role to play in acne. Mostly found in the T-zone (nose, chin & forehead), whiteheads can also be found on the shoulders, chest, back, arms, etc. Relatively easier to treat, the best way to prevent whiteheads is to keep the skin and hair clean, use non-comedogenic products, avoid excessive exfoliation of the skin. Those small, white bumps surrounded by red skin, filled with fluid or pus, are called pustules. Very similar to the usual acne, these can grow big in size and can develop on any part of the body, including the shoulders, chest, back, face, neck, underarms, pubic area, hairline, etc. Acne is the result of a clogged pore due to excess oil, dirt and dead skin cells; when acne causes the skin to bulge, it results in a pustule. Pustules may be painful to touch and can call for medical attention if they grow in number rapidly, causing a bacterial infection. Pustules are tempting to pop, however, that could cause them to grow and can leave scars behind. The best way to treat them is to use an acne soap with lukewarm water to thoroughly clean the skin, and then apply best acne gel to treat them the right way. When pustules are left untreated, they become hard and painful and may develop into a cyst. The most serious form of acne, cystic acne grows deeper within the skin and is relatively bigger than any other form of acne. A result of hormonal imbalance along with the other common causes, cystic acne looks like a boil in the first go and is also tender, red, and painful to the touch. These can occur not only on the face, but also on the chest, back, arms, shoulders, neck, behind the ears, etc. Cystic acne takes time to form and while preventing acne in the first place is the best prevention, if the acne has developed into a cyst, consulting a dermatologist is the best option. As these tend to leave scars behind, it is crucial that extra care is given to cystic acne. It is recommended to use an acne soap if you have an oily skin or live in a humid area where the skin tends to get sticky all through the day. A mild cleanser like an acne soap not only removes the extra build up from the skin’s surface, but also ensures that the skin is acne free. If acne keeps recurring despite using an acne soap and over the counter acne gel, it is important to consult a doctor and get the hormonal level of the body screened and treated.